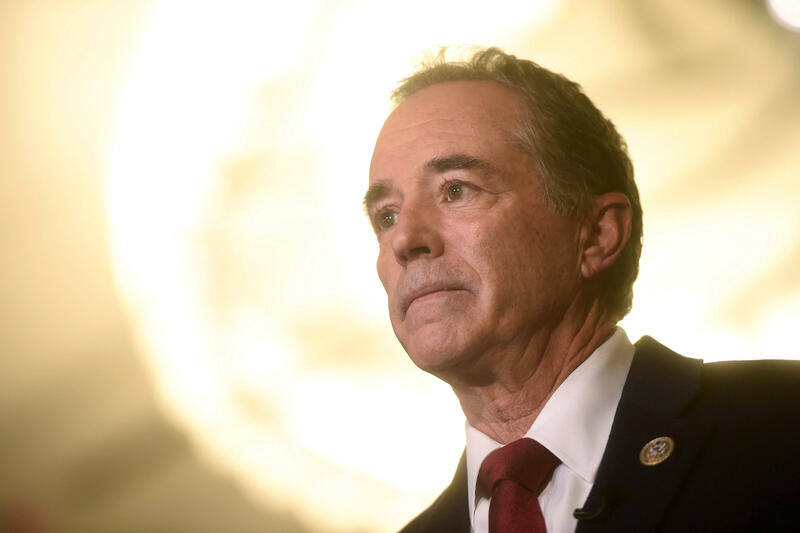 Rep. Chris Collins' indictment on insider trading charges sent ripples through Washington on Wednesday. Collins, the first member of Congress to endorse Donald Trump for president, was key in supporting Mr. Trump early on. One of the most pivotal moments in the prosecution's case actually, allegedly, took place at the White House picnic last year. CBS News' Sara Cook and Arden Farhi uncovered video of Collins on the phone, at what appears to be the same time federal investigators claim Collins was making a call to his son to tell him to sell stock in Australian biotech company Innate. Collins endorses Mr. Trump, becoming the first member of Congress to do so. Collins then holds weekly meetings with members of Congress to persuade them to support him. Collins is a warm-up speaker at a Trump rally in Buffalo, New York. Collins speaks at the RNC Convention, seconding the nomination of Donald Trump for president. "I have the honor of seconding the nomination of Donald J. Trump as the next president of the United States of America," Collins said at the time. Collins is named to the Trump Transition Team Executive Committee. Collins sits next to Mr. Trump at a White House Roosevelt Room spray for members of Congress who were early Trump supporters. COLLINS: "Well, Mr. President, we're all honored to be here. This is really our Trump caucus reconvening for the first time in a little bit, but our first meeting was the first part of March. Duncan Hunter and I both endorsed you on February 24th, a week from tomorrow. So it's the one-year anniversary. But this is the Trump caucus, reconvening, and we're just so honored you're taking time out of your busy schedule to be with us." THE PRESIDENT: "These are real friends." Collins attends the congressional picnic at the White House. The indictment against him states he made phone calls to his son about the stock in question while at the picnic. Collins can also be seen in this photo posted to Twitter by a CNN journalist. Collins also posted a photo to his Instagram feed. "This has truly become, as you know, a wonderful tradition," Mr. Trump said at the picnic. "It's the very first Congressional Picnic that Melania and I have the pleasure of hosting, so I hope you enjoy it. I hope you enjoy it. We've gotten to know many of you over the last weeks and months and developed many friendships with politicians. Can you believe it? (Laughter.) And some really great people, I have to say — mostly, mostly. A couple of bad ones but that's okay. (Laughter.) But we're honored to host you at the White House and privileged to count you as our very close friends — so many." House Ethics Committee receives a referral from the Office of Congressional Ethics regarding Collins. "Let me also express our gratitude to the members of the New York Delegation here today: Congressman Chris Collins. Where's Chris? Oh, Chris, right from the beginning he said, 'Trump is going to win. Trump is going to win.' So I like him." The House Ethics Committee announces it is extending the review of Collins for improper stock trades. The committee also released the report on the matter from the independent Office of Congressional Ethics, which said, "there is a substantial reason to believe that Representative Collins shared material nonpublic information in the purchase of Innate stock, in violation of House rules, standards of conduct, and federal law." Collins joins Vice President Mike Pence for a tour of a manufacturing facility in Buffalo. Collins is indicted in insider trading charges, turns himself into the FBI.